All in one--locks itself! Nothing extra to buy. The UMAX 100 fits 1 7/8", 2" and 2 5/16" couplers. It has a hardened 5/8" Steel Shackle. It has a dual ratchet locking systems, so you can fasten this lock as tight to your coupler as possible, and it won't come off. It has rugged tubular keys with key hole covers & a corrosion-resistant finish. Simply fits up inside your coupler to form a barrier where someone might insert a small ball to tow you otherwise locked trailer off. Great theft deterrent! The difference between the UMAX50 & the UMAX100 is that the main body is covered with ballistic grade nylon housing for corrosion resistance. 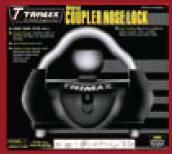 If you want to buy the best coupler lock for your trailer, this is it!